ALMONDBURY OLD is a traditional Old Ale, a style which has enjoyed a renaissance among the new breed..
Birkby Bitter is Brupaks entrant in the session beer category. 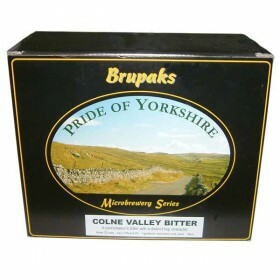 Less hoppy and slightly sweeter than ..
COLNE VALLEY BITTER is a true classic in the tradition of full flavoured English Bitters. With the e..
FIXBY GOLD is a beautiful golden ale with a distinctive hop and grain character. It works well as a ..
Kirkburton Ale is intended to appeal to the brewer who is looking for something a bit special. It is..
WEST RIDING WHEAT is a Bavarian style wheat beer with a very soft palate and a dleicate hop characte..
BLACK MOOR STOUT is a dark ale in the traditional Irish style. It has a strong, roasted barley flavo..